Yumix cocktails are revolutionizing the mixed drink industry, offering 3 classic flavors in an innovative dual-chamber design bottle. Yumix comes in 3 flavors: Margarita, Orange Mango, and Sea Breeze. Each flavor comes in a 50 ml plastic bottle with a screw-on cap and a patent-pending twist-off compartment at the bottom containing the liquor needed to create your own cocktail—anywhere you are! Finally, a more portable option for those who love mixed drinks and cocktails. 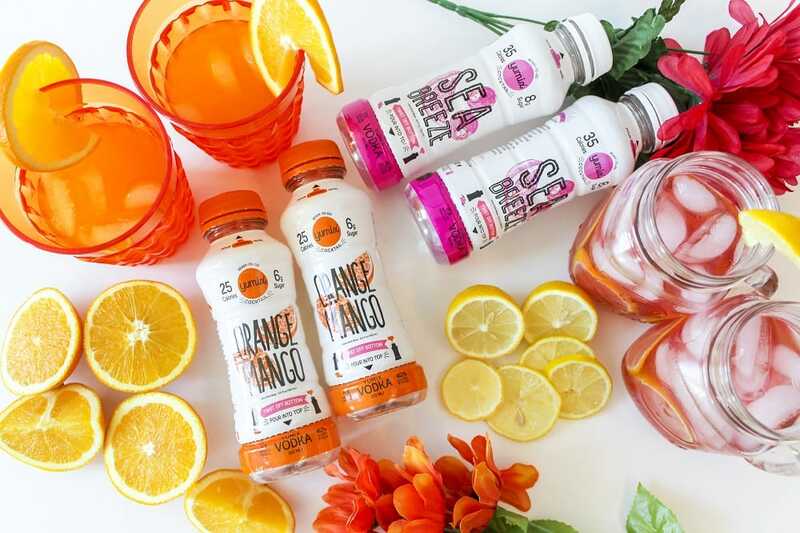 Orange Mango and Sea Breeze include 80-proof grain vodka, distilled 6 times, while the classic Margarita flavor incorporates 80 proof Mexican tequila. The unique twist-off chamber design allows you to pour exactly as much alcohol as you would like into your cocktail. Each flavor is also low in sugar and calories, with only 25-35 calories and 6-8 g of sugar in each bottle. Naturally sweetened and full of flavor, these cocktails are sure to be a hit at any party, beach trip, picnic, or tailgating event. Creating delicious cocktails has never been more straightforward or convenient—simply twist off the bottom, remove the seal, and pour as much liquor as you’d like into the main portion of the bottle. Each flavor is smooth, refreshing, and exactly what you would expect from even a high-end cocktail at a bar, but at a lower price (and with lower sugar and calories). Yumix is an innovation in cocktails, perfect for those who are looking for an alternative to other bottled alcohols like beer and flavored malt beverages. Yumix cocktails are tasty, and much lower in calories and sugar than many other options around the liquor store. The re-sealable bottle also makes it ideal for travel, a first for lovers of mixed drinks. Gone are the days of packing away a heavy bottle of mixer and a bottle of alcohol for mixed drinks on the go. With Yumix, all you need for a delicious Margarita, Orange-Mango Screwdriver, or Sea Breeze is right at your fingertips. Margarita – with 80 proof Mexican tequila and fresh lime juice, this classic and refreshing flavor has only 30 calories and 8 g of sugar. Orange Mango – a delicious twist on the classic screwdriver, orange and mango bring a citrusy sweetness while 80 proof vodka packs a punch, while only containing 25 calories and 6g of sugar. Sea Breeze – a refreshing take on the cranberry-grapefruit classic, this flavor is a sweet and tart mix that includes 80 proof vodka. With only 35 calories and 8g of sugar, enjoy to your heart’s content. For more information visit Yumix website. Summary : Yumix is an innovative line of cocktails packaged in a dual-chamber bottle to allow for easy and customizable mixing on the go.